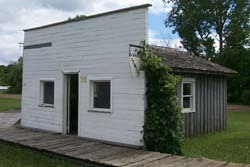 This is the dental office of Dr. Arthur Wedin, who was a dentist in Hector, Minnesota, for 50 years. 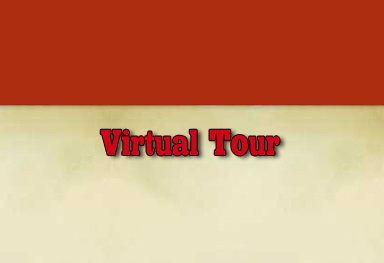 He was a graduate of the class of 1917 at the U of M School of Dentistry. His class picture on the wall shows that there were seven women in his class that year. 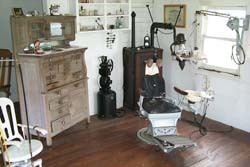 The dental chair, cabinet, and X-ray machine all date from 1917. In the rear is the lab bench where dentures, crowns, and inlays were made. The white steel chair and foot-powered drill were in use before days of novocaine and electricity. Note the wrist straps on the chair the dentist wanted to be sure not to lose any of HIS teeth while working on a patient!